Does this data factor in blocked FGs? What also needs consideration is which hash the FG attempt was made from. Once you get past about 30 yards there is a difference of several percentage points between the two marks. Well, we see why Belichick didn't pay a lot of money to keep Vinatieri (even apart from the fact that Vin is near the bottom of this list). The league-top FG % rate is nine percentage points above the average. Teams on average attempt about 30 FGs per season. So 30 x 3 pts x 0.09 means a league-top FG kicker will net about 8 pts per season more than the average kicker. Of course most of those points will be in non-close games where they don't matter much. On average a NFL team increases its net scoring margin by about 17 points to increase its W-L by one win. So having the best FG kicker in the league (compared to an average kicker) will win a team almost one game every two seasons. Or maybe not even that, because if you have take money from another position to stay under the cap after paying big bucks to sign a "never miss" kicker, you may weaken yourself at that other position in a way that costs you offsetting points, maybe a good deal more than 8 of them. Moreover, are these kicker rankings stable year-to-year? (Look where Vin places here.) The number of misses is quite small, suggesting small sample size. If a good deal of the spread from top to bottom is noise, then the "best" kickers are even less better than average than it looks here. 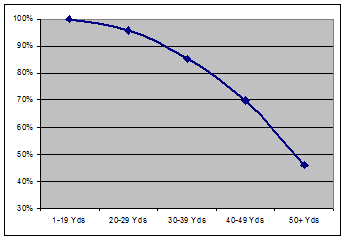 It's no wonder so many FG kickers are transients. Regarding blocks, the NFL counts them as missed a missed FG, unless in the opinion of the official scorer the block was due to a bad snap or hold. Regarding hash marks, I've never heard that before. I would think that the further out a kick is, the less the hash mark matters. The angle becomes less acute. I can see there might be an effect close in. I know teams like to get the ball between the hash marks for short FG attempts when possible. An attempt from either hash makes the goal posts appear narrower geometrically, but it would be equal from either hash. Any effect would be far larger for college than the NFL with its very narrow hash marks. JG- The rankings are somewhat stable. Check out my previous post "Improved FG Kicker Ranking" to see how the kickers fared in previous seasons. I'd shocked that dome/non dome teams and cold/nice weather teams aren't better -- there are a bunch of cold, non-weather K (pitt, cincy, chi, buf...) near the top. Anon-Home field domes and warm weather environments are accounted for in the regression. The link immediately above your comment explains everything. There was a rumor going around (and stated pretty confidently by at least one announcer) that Vinateiri was playing hurt most of the year. His improved kickoffs and hitting his first 40+ yard fieldgoal after some rest in the SD playoff game supports that idea. I hope he was hurt, the Colts aren't paying him 2.5million for that kind of performance.